Connie Madden: My interest in the language of aging has been fueled through my experiences as a nurse educator talking with students about their experiences and perceptions. Through PhD course work as a student in the University Of Utah Hartford Center Of Geriatric Nursing Excellence, I have been able to expand my interest through exploring the relationship between language, perception and the practice of providing nursing care for older adults. In a particular course, The Philosophy of Inquiry , Dr. Kristin Cloyes helped put those pieces together through examination of anti-aging and healthy aging language as it intersects in the larger aging discourse. Kristin Cloyes: It’s always inspiring when a scholar is able to take the typical structure of a required course and shape it into something they really want to say, growing a field she or he is passionate about in new directions. In this case, the structure involved a required course paper in which I ask students toexplore a central concept in their area of interest, to identify common epistemological assumptions that shape the field and to explore how these assumptions stand up when viewed from differing frameworks. 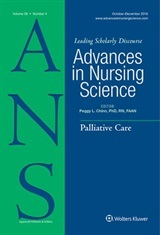 Connie used the paper to embark on an incisive analysis of assumptions about aging, and how these may shape nursing education. After I suggested that her thesis should be developed for publication, I was lucky enough for Connie to invite me to help expand and refine her ideas about the discourse of gerontology as an emerging area of study.